JULEP: from the Arabic julāb or Persian gulāb, julep translates to rose water. Originally a medicinal cure for stomach ailments, the Mint Julep is a particularly American drink favored highly in the South as a cool, refreshing summer cocktail. Though originally it could be made with Cognac, brandy, gin or whiskey the most common modern version is made with Bourbon. The Mint Julep is the official drink of The Kentucky Derby where over 100,000 are served up to racegoers each year. In recent years, however, a commercially pre-mixed substitute has been offered up in place of a true Mint Julep. This is understandable because of the multitudes being served, but still it's a sad tribute to a great drink. 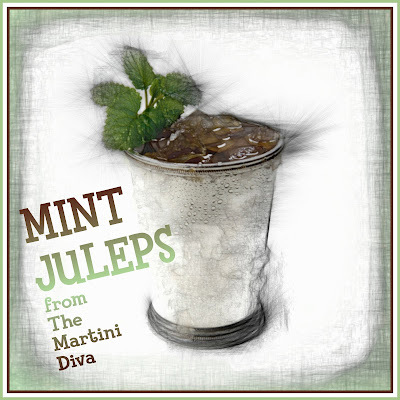 As a member of the Smash family of drinks, a real Julep consists of fresh mint leaves, spirit, sugar, and water (ice) and is constructed by first muddling the mint and sugar in a glass (traditionally a Julep Cup), filling the cup with crushed ice, adding the spirit (traditionally Bourbon), then mounding a bit more crushed ice over the top and garnishing with a fresh mint sprig. Spearmint is the preferred herb, though peppermint can be used. Below are some of my happy hour riffs on this classic Southern libation.